You can also create a new task by simply sending an email to task@meetingking.com. You do not need to be logged in, all you need is a MeetingKing account with the same email address you use to send your email from. Very practical for when you are on the go or when you receive an email message and want to make that a task. 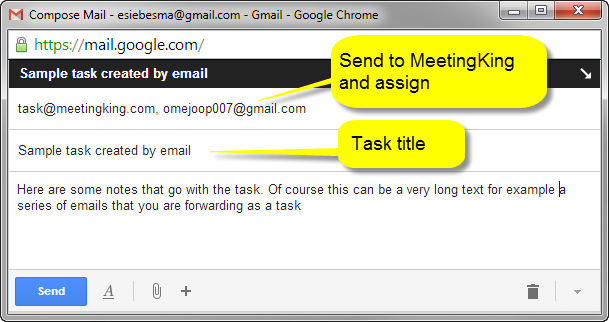 How to create a new task via email? To assign a task add the email address of the task owner in the “To” or “CC” field. A few minutes after emailing your task it will appear in the “Ideas” column.